Every welder understands the importance of having the best welding helmet available because it is a critical component of a welder’s arsenal. 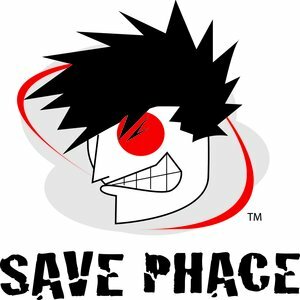 There are also several choices to pick from that are outfitted with a variety of different features including auto-darkening and passive options. A quick look at some of the best Miller welding helmet reviews will reveal how highly rated their products are. 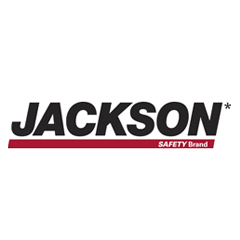 They are genuinely interested in providing only the best protective apparel because they are interested in your safety and general metalworking success. The reviews below will give you a better idea about what Miller has to offer in regard to protective headgear for welders, so your buying journey is a bit easier, and you are more well informed about the options available to you. Miller offers traditional manually operated welding helmets as well as digital welding helmets. In addition, they also provide lengthy warranties that back their exceptional products. 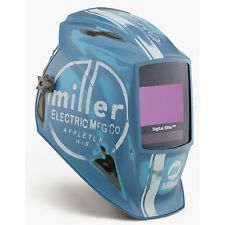 Achieve unprecedented levels of control when using the digital elite series welding helmet from Miller. You can now adjust the mode and settings of operation. While you have more control, the helmet dictates to itself when to go on and off. It has an automatic power control that triggers the lens when you strike an arc. In addition, you can take advantage of its four operating modes cut, weld, grind, and X-mode. 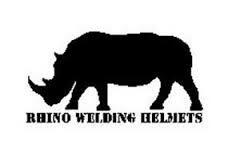 It is no wonder that the helmet is one of the best Miller welding helmets that are available. It comes with a large viewing area that measures 9.22 square inches. As a seasoned welder, you understand the advantages of having a large viewing area. If you are a beginner, you should consider investing in this helmet and begin taking advantage of its many benefits right away. In addition, you can also enjoy the 3-year warranty that the manufacturer extends. This Miller welding helmet weighs 2.9 pounds; it measures 12.2 inches in height, 10.3 inches in width and 9.8 inches in length. The package comes with a magnifying lens holder, two inside cover lenses, five outside cover lenses, and replaceable lithium batteries. If you are looking for a more lightweight option, you should consider investing in the 235626 welding helmet variety that Miller offers. It weighs a meager one pound to ensure it stays on your head all day long without compromising your speed and efficiency or becoming too uncomfortable. It employs a standard sized filter plate for maximum protection against the harshness of welding and plasma cutting. In addition, it comes with a magnifying lens holder. As it features a large 16-inch squared viewing area, it is the best bargain on the market yet. The only drawback is the fact that the lenses of this helmet do not have the modern auto-darkening technology. However, this is not a serious hitch for anyone doing metal fabrication for light construction. It measures 15 inches in height, 10 inches in width, and 7 inches in length. It is probably named ‘inferno’ because it can serve you even in the toughest and hottest welding conditions. 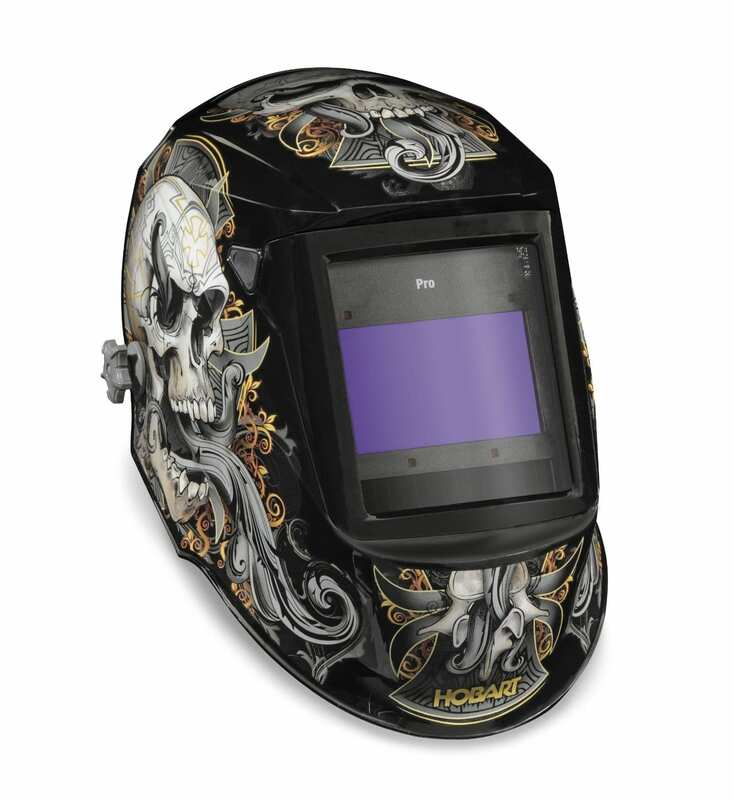 In this regard, it has variable shades of #8 – #13, meaning that you can protect your face in all welding scenarios. You will fall in love with the automatic On/Off power control and the discerning grind mode settings. This Miller welding helmet is made of nylon plate construction and has four analog controls. It comes with a magnifying lens holder and two lithium batteries. The batteries will serve you for an incredible 3000 hours before getting used up. When the batteries begin to run low, an automatic indicator alerts you. You can also take advantage of the four arc sensors that react to different lights at lightning speed of 1/20000 seconds. 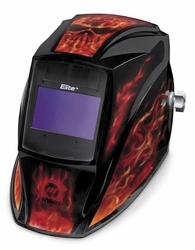 To achieve a protected and stylish look when welding metal, operating plasma cutters, and doing general metal fabrication, this Miller welding helmet belongs to the Digital Elite series family and has stylish reddish-orange impressions of flames imprinted on the black background. While stylish, its design certainly doesn’t compromise on quality or safety. In fact, it boasts of heavy-duty nylon plate construction. It can work under various filter shades-3, 5 – 8. 8 – 13. One difference between this helmet and others in its family is that this particular welding helmet weighs 2.8 pounds which is slightly more than the others. However, it still has the innumerable additions just like its counterparts including the magnifying lens holder, lithium batteries, and various cover lenses. When choosing the best Miller welding helmet for your welding needs, it is important to consider a few primary factors along your buying journey. The helmet fit is going to be one of the most important factors. If the helmet doesn’t fit right, then you may experience spatter or UV rays to exposed skin. Aluminum, for example, is a highly reflective material, so your skin can burn badly if exposed because the helmet doesn’t fit. Having a larger viewing area will also prove to be important because often, the more you are able to see, the better. A larger viewing area will come in at around 3.74 x 3.34-inches. Finally, another consideration that may be often overlooked is the helmet power source. Some come with a power supply that you will not be able to replace, so you might want to keep this in mind when choosing a welding helmet. Choosing a helmet with a replaceable battery or solar cell may be the best option for your particular needs. The automatic on/off feature will also help to save on power as well. When choosing an auto-darkening helmet, make sure that the model you choose features a full-coverage shell that was designed to reflect any spatter while also resisting any impact. It should also comply with all safety standards. There should also be a test-mode feature integrated into the auto-darkening lens to make sure that the helmet is in optimal working condition before initiating an arc. Recently, manufacturers have also developed technology that alters the lens color spectrum and provides welders with a much more natural view. Having this natural view can mean more control of the weld puddle and much less eye fatigue. When finding the best welding helmets in this competitive landscape, the suggestions for Miller welding helmets above will be a good start and can definitely point you in the right direction for the best protection for your face and eyes.